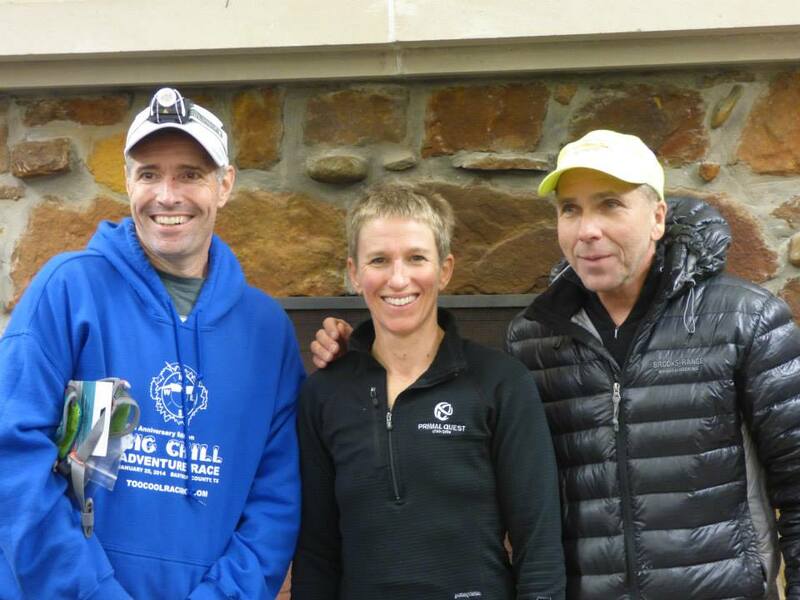 I was back for my 10th time racing The Big Chill adventure race with a new team configuration. All of the original Vignette folks were unavailable this year so I posted on Facebook to see if anyone wanted to race. First to jump on board was Beth Reyburn. It has been many years since Beth has done an adventure race (due to her having a couple of kids or something). Next in was Dustin Branton. We have raced together a couple times in the past. To round us out Doug Cousineau jumped on the team. The race was shortened to 12 hours this year (attendance for long races just keeps dropping). Art and Robyn (the race directors) were using their more recent format of having more checkpoints out there than most teams could get before the cutoff time. This allows all teams to race the full 12 hours. I really like the format. The tricky part is guessing when to start skipping points to make the best use of time. It adds one more layer to the whole adventure racing concept. The weather leading up to the race had been pretty bad by Texas standards. There had been lots of rain, which Texas badly needs, but would likely make for a muddy course. At 7am the maps and course booklets were handed out. After a quick pre race meeting we were told to be back at 8:50am for a surprise start. I had my travel trailer at the campground so we quickly retreated to the warmth of the RV. It was right at 33 degrees outside so still a bit chilly. We quickly started plotting all the points on the map. The course had a lot of biking from a quick look. Beth and Doug were happy as they are both very strong on the bike. Dustin and I were a little less thrilled. We finished all the plotting and started reviewing the course. Next, we tried to make some time guesses for the course sections. 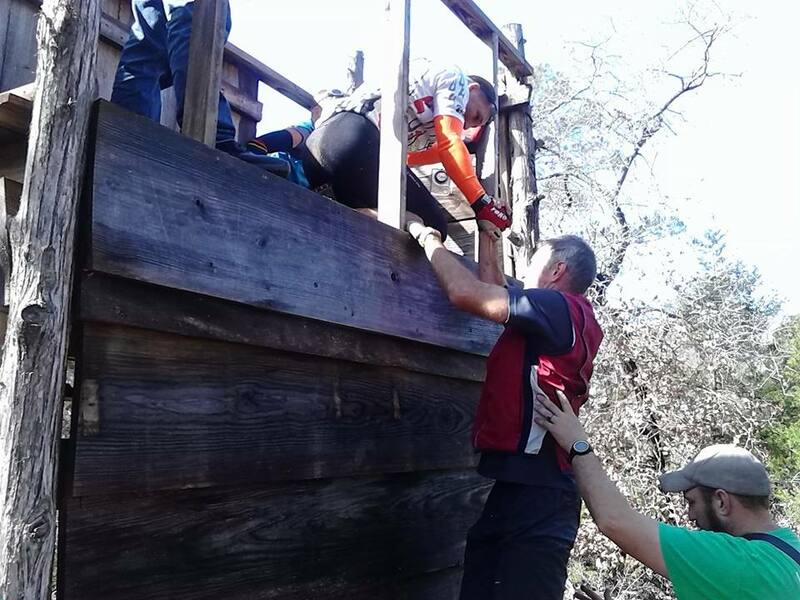 I really thought if the muddy trails did not slow us down too much and we did not make too many navigation mistakes, there was a good chance we could clear most of this course. We all agreed we would not skip any early points. A couple things stood out: First, there was no urban section, which has been standard for this race for quite some years. And second, we were going to a few areas that had no clear routes on the topo map, so there would be areas to figure out when we get there during the race. The first official leg of the race was mountain biking the north Shore trail from the starting park. There were CPs located along the trail at certain bridges. We were told we would get that map at the start. I knew that trail could be rather messy after it rains. I hoped to get out in front on that trail to avoid big bottlenecks of crashing racers on slippery trails. 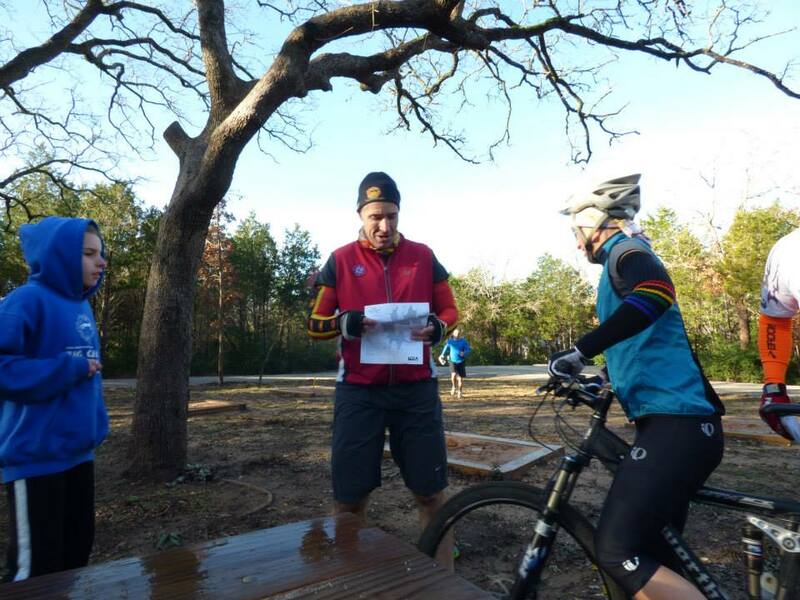 At a few minutes to 9am we were given the trail map and the prologue leg. As soon as "go" was shouted, I opened the map and saw we had to run about a half mile to the other side of the campground. We were off quickly along with a mob of other teams. As we ran, I read rest of instructions. Stop, I hollered to my team! A note on sheet said said we must have one bike with us and the rest running on foot. Beth volunteered to bike so she ran back to TA and grabbed a bike. Most of the teams that were ahead of us just kept running. I don't think many turned around until Beth started passing them on her bike. We were the 4th or so team to the first location. The volunteers there were telling teams who had forgotten bikes to go back. I think this pushed us into the lead. Back in TA, we got our official passport and were ready for a very long leg of this race. Leg 1 was a bike leg to the North Shore Park (we started at South Shore Park). We have in some years been able to shortcut riding some of these trails by jumping on nearby roads, but not this year. The points were located where it did not make much sense to try and get to roads. As expected, the trails were wet and muddy. One team did get onto the trails ahead of us. We rode behind them for a few minutes, then we were able to pass around them. One of the racers on the other team had super skinny slick tires on his bike and I am sure it was not a fun day day on that bike with with all the muddy trails we rode. We got all the trail CPs just fine. At North Shore Park we hit paved roads for several miles. Doug set a hard pace and we all were happy to pace-line it for the whole paved section. We entered the park again, much farther north. This was one of those areas that is not marked well on the map. I have raced in this same area a few times and had confidence. I joked we were making it too easy for teams behind as all they had to do was follow our muddy bike tracks. Wow, did I jinx us! Basically, I got us lost by taking the wrong road. So if anyone followed us, sorry. The big issue is there are lots of little roads and trails that are not on the old maps. I knew our direction of travel so we did have have a rough idea of our location. 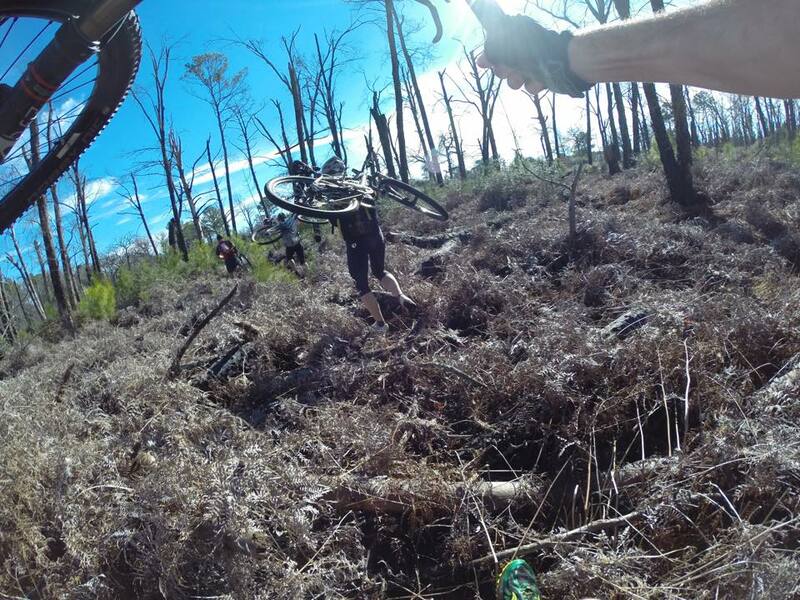 Instead of back tracking, we decided to bushwhack with our bikes to a big powerline. Some of it was tough going and it cost us about 30 minutes. We popped out on the powerline about 300 meters from the road we had hoped for. So close but we never saw it through the woods. Unfortunately, lots of racers were around now. No more lead for us. Good news was that nobody on the team was upset or fazed. We quickly agreed to just keep racing. We had to backtrack a little to get a checkpoint we had missed. Once that was done it was hammer time. Back on track we got the next couple of points just fine. People were choosing lots of different routes in this section. Odd to see teams going every which way. We chose to take Gotier Trace Road instead of the more muddy trails which would have been a little more direct. The next CP at a cemetery was familiar as we have done that one in years past. The CP after that was where the road on our map dead ended. I figured the road must go on in some way as there was a bike drop and trekking section about a kilometer away. Sure enough, the road road did continue and it led to a back entrance to Camp Wilderness Ridge that we were looking for. We had arrived at the bike drop and end of leg 1, it was a bummer to see lots of bikes already there and ahead of us. Leg 2 was a big special test at the camp. We had three points/tasks to complete. We had a color coded camp map with all the trails and trail markers on it. Uh-oh, I am colorblind, so Dustin grabbed the map and did our navigation around camp (and he did a great job). The first task was a tall wall that we had to get the team over. Easy enough to help each other over the top. Next up was an archery challenge. Dustin nailed that one quickly. The final challenge was each team member had to throw a tomahawk in a target. This was TooCool. It took a few tries but we all got it and nobody was injured. Back to the bike drop, we got our passports checked (to prove where we had been), and we were ready for leg 3. This was the first real trekking leg with navigation. We would have to run a mile or two down to Buescher State Park and start what I considered to be the fun part. I had a good attack plan and we hit all 3 points dead on. The team moved quite well through all the thick brush. 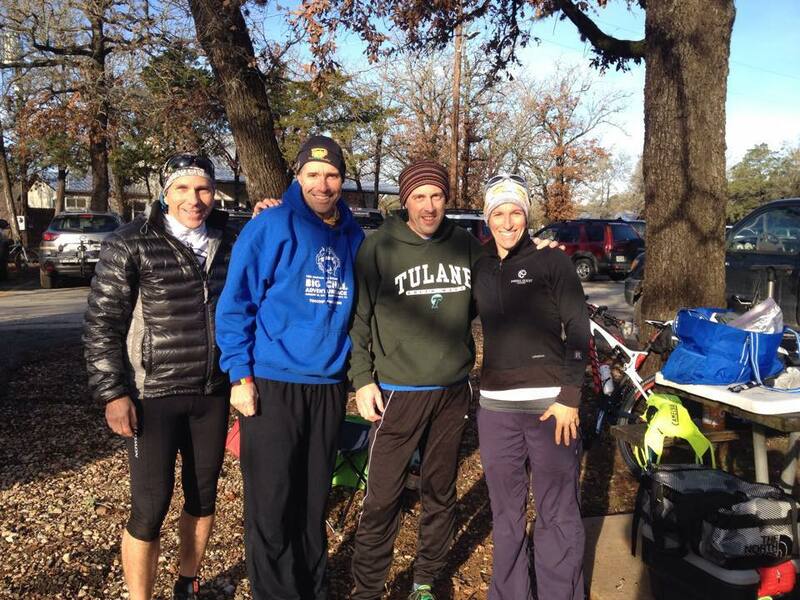 We ran into Team XMA at the pond point and they pulled us off of the right direction, but we all quickly corrected. With this section done, we ran back to the bike drop, arriving at the same time with XMA. The good news was that in this section we made up all the time that my nav error cost us earlier. Gabe's team got out on the next leg ahead of us. I think us and XMA all left about the same time. Leg 4 had us back on the bikes riding park road 1c over to Bastrop State Park. This road is paved but super hilly. Not far in, we caught up to Gabe's team. Ryan was cramping up so he was working it out. We had points down a long power line (in different directions) on this leg. These were points we had talked about skipping pre-race. In years past, these power lines have been no fun at all to bike. We were now back in the lead so a critical decision needed to be made. If we could stay relatively navigation clean, I still thought we had time to get the rest of the points, so nothing to do but head up the powerline for these points. We chose the northern point first as it was closer and would give us a chance to test how bad the power line was. This was a bike/trek, meaning we could bike as close as we wanted and trek the rest of the way. 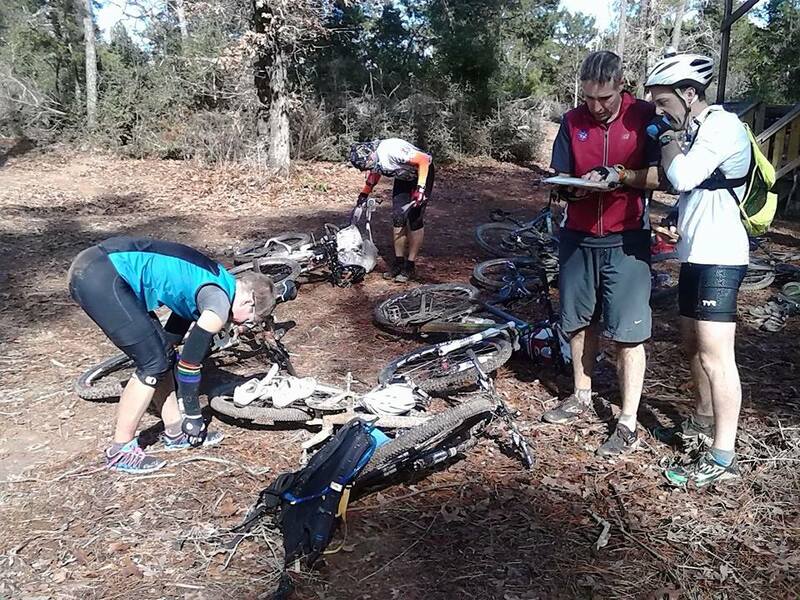 We dropped our bikes and made a good nav decision straight to the CP. As we turned around Gabe was coming in right behind us to grab the point. Back the way we came and back on the bikes. We decided it would be best to get the other powerline point also, as the riding was not that bad. On the way to the second powerline point, we saw the team of Flying Monkeys bushwhacking down a big hill from the road. (They had taken an alternate route vs riding the powerline). One of their guys was far out in front and was in the correct area of the CP when we arrived. We went to the point and punched it, which revealed to the other team where to go, so they followed us in. Now to finish this bike leg, we had to get to Bastrop State Park (the scenic overlook parking lot in particular). We made a good bike push to get there in good time. It was now time to be off the bikes for a while (yeah!). Leg 5 was a trekking leg around Bastrop State Park. We have not been able to use this park much due to the huge fire several years ago. I do recall many years ago going into a few of the areas that we would be heading. I knew it could be confusing for sure. We decided to make a loop that roughly followed the park road in a counter clockwise fashion. We moved well and hit every CP dead on (nice when that happens). There was a time cutoff to leave here by 6 pm and it was maybe 3:30 when we finished the loop. There were two other points in the opposite direction (of the loop) and one of them was kind of far off and pretty far from any good trail or road attack point. Everyone was moving very well on their feet so we went after the points. I am glad to say everyone was able to run all the runnable sections. We got these last two points and started making our way back to the bike drop. I don't recall seeing any other teams on this trekking leg which was odd. That could either mean we were doing well, or that other teams found better routes. Like most points in this race, you can get them in any order you choose, so it was really hard to tell where you stand. Back at the bikes, the volunteer told us no-one had left yet (a good sign for us). Gabe's team was there, but they told us they chose to use their "skip point" on the far off point in this leg. 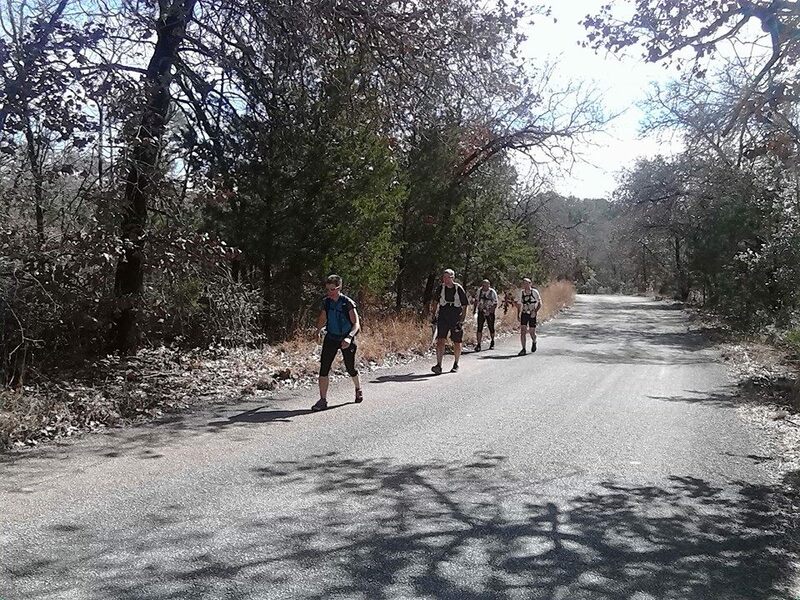 For this race, TooCool allows a team to skip any one (non-mandatory) point in the race if they donate food to the Bastrop Food bank. We were still holding onto our point at this stage, so essentially even though we were even in the race, we had a one CP advantage as we could still skip something later in the race. It was still before 5pm, so we made the cutoff with time to spare. Now all we had to do was bike it back to South Shore Park. It was an easy pavement ride back to the park. 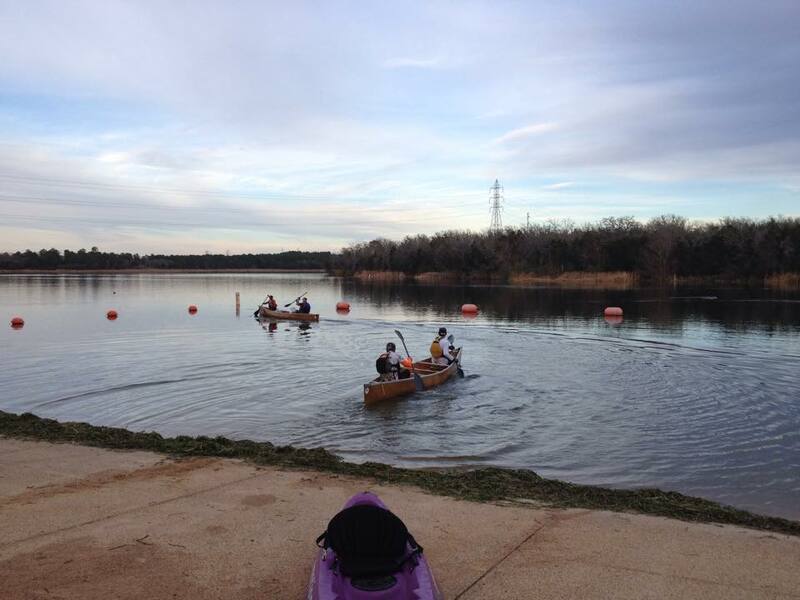 Gabe and Ryan's team pulled in 30 seconds behind us. This was our first time back in TA since the start of the race. It was now about 5:15pm and still daylight (we had been gone all day, so any spectators were likely quite bored). Once we checked in, I was itching to get us back out on the course (nice to feel great the whole race and not need time in TA). We had two legs left and still had our skip point to use. Next up was the paddle leg. In some years, the lake here has been a huge mess with giant waves. Not this time! The lake was smooth like glass. This was going to be an enjoyable paddle. This was also where we had really hoped to use our skip point. There was one CP off to the northeastern corner of the lake all by itself. I don't think it would have been a challenge at all to find it, but it was a 4k+ round trip to go get it. Later, Gabe told us they thought they could paddle to this point faster than getting that trek point, which is cool as all teams can make a plan that suits them best. We got the other lake points just fine and pulled our boats back to shore just as it was getting dark. On to the final leg, which was a trek. Treks make me happy these days! There were only four CPs: Two north of TA and two southeast of TA. The two south looked pretty easy as I knew there were trails in the area. The two north had me a little more concerned as I know the area is a real mess with lots of steep hills and nasty underbrush. I think we were all a little chilled after sitting in the boats for a while. We grabbed some food to eat and headed out for the northern points first. We picked up the first one nice and quickly. The second one was not far away and it showed to be right next to a bend in a gas line (the ground above gas lines are kept clear of brush by the gas company). We popped out on a powerline and just assumed that was also the gas line (there was no powerline shown on our map). We followed the powerline for a bit and it too had a bend in it. We searched the area pretty close and actually saw another team nearby. We then figured we were just too close to the dam so we headed west through the woods and quickly found the real gas line. Ugh, a nav mistake, but it only cost us maybe 15 minutes searching on the powerline. They ran parallel so it took us pretty close to where we needed to be. On the gas line we found the bend in just a couple of minutes - but no CP. We searched the woods all around this area, went back to the creek and pace counted back, still nothing. After 40 minutes we decided we had better bail... until another team showed up. Now, we figured we should make sure they did not have it plotted somewhere else so we compared maps and sure enough we all had it plotted in the same location. They could not find it either. Time was getting short. We still had two CPs well past TA in the opposite direction. We agreed to bail on this point and get the other two. So, we all kicked it into high gear and started running. Back to TA, then out the other side. No one on the team complained although I am sure someone had to be tired. We all knew to get these two points and back before the cutoff time we simply had to run, so we did. We got the first point, then a long out and back run to the second. Doug was watching the clock to make sure we turned around in time. At this race, for every 5 minutes past the cutoff time, you lose a CP, so being late does not pay at all. I knew just how to get to this last CP, so we ran as quickly as we could. As I stopped running and told the team it was time to jump into the creek and start looking for the CP Doug told me we had 7 minutes max to find this thing. 30 seconds later, we had found it, punched it, and were out of there! We all were quite worried that another team had found the one point we couldn't. Or someone could have gotten the same number of checkpoints as us. So we all ran hard to the finish line. In this race, the winner is the team with: All mandatory CPs, then the most optional CPs, and further tiebreaks are by fastest time. At this stage we had used our skip point on the paddle, so we had all but one optional CP (because we couldn't find it. As it turns out, no team was able to find it, but the race director Art later confirmed it was still there). We wanted to make sure it did not come down to time. We really flew back to TA (everyone was ready to be done!). We made it back a good 20 minutes before cutoff time. The race director told us we had won our 4 person division, but there were still 2 teams out on this trek that could beat us if they found more CPs (Gabe's and XMA). The 20 minute countdown to the race time cutoff began... And in the end, our position held. The other teams also went north first and could not find the elusive point either, so we won on both max optional CPs and time. A super race with a super good team. Thanks to all involved!